Porsche has remarkable maintained its sportive instincts since time. 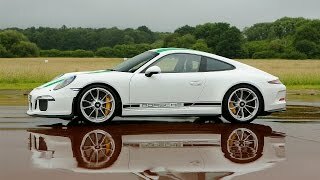 The company presented on of the best automatic transmission with the 911 GT3 but now they are coming with a naturally aspirated manual transmission with their Porsche 911 R 2017. The performance driven model carries the 1967 model badge and is designed to perform. 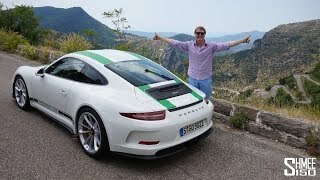 Let us have a look at the review of Porsche 911 R 2017 to know more about it. Getting to the interior of Porsche 911 R 2017 you’ll first notice the carbon-fiber seats wrapped in tartan cloth. The integration will take you to the original 911 we saw years back. However the door handles and lighter pull straps get new look, while the air conditioner and radio unit are removed so as to decrease the model weight. The black steering wheel features aluminum accents while the bespoke gearshift lever gets carbon-fiber inserts. Basically the interior is designed to lose the overall model weight and provide the sportive comfort to the drive and the passenger. Removing the rear seats could be another way company tried ditching the overall weight. Thus concluding the interior details of Porsche 911 R 2017 I would call it sportive and no nonsense work of engineering and design that carries legacy cues. The exterior of Porsche 911 R 2017 carries bit of resemblances with its GT3 sibling and is concentrated to ditch the weight of the model. However it does brings a change and it is with the engine lid that now has a conventional grille and retractable spoiler. With these the spoiler lip and diffuser also gets new design. Apart from these all the front and rear hood and fenders are made from carbon-fiber while the roof comes drenched in magnesium. With these changes Porsche has commendably managed to make this model 110 Pounds lighter than its GT3 siblings. 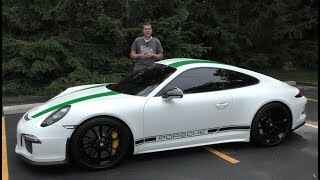 Thus rounding up the exterior details of Porsche 911 R 2017 I would call it sportier and a lightweight model. Powering the Porsche 911 R 2017 is a 4.0 liter six-cylinder engine generating total output of 500 hp and peak torque of 460 nm mating to naturally aspirated six-speed manual transmission. 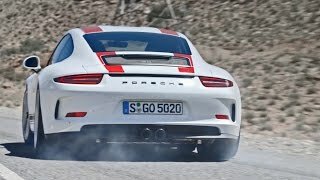 With this the model can sprint from 0-62 mph in just 3.8 seconds while the top speed of Porsche 911 R 2017 touches the mark of 200 mph. Thus the model isn’t just lighter but a better performer in comparison to the GT3 and GT3 RS siblings.